At FreeVis, we perform LASIK as a corneal wavefront-guided Femto-LASIK that allows customization of all steps of the procedure. Typically, the less severe the refractive error, the more precise the result of LASIK surgery. Femto-LASIK is also known as All-laser LASIK, bladeless LASIK or IntraLASIK. It permits the individual correction of the refractive error for optimized results. The femtosecond laser is used for the initial part of the LASIK surgery when the corneal flap is prepared. 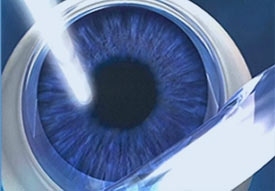 The surgeon then switches to an excimer laser to achieve the cornea ablation and correct the visual disorder. A special contact glass is placed on the eye for the laser pulses to pass through and focus into the cornea. The surgeon uses a microscope to follow the progress of flap creation. After the cut is completed, the contact glass is removed. Using a fine instrument, the flap is folded back exposing the stromal bed of the cornea. At this point, the excimer laser is used for the corneal ablation to correct the nearsightedness, farsightedness and/or astigmatism. When the ablation is completed, the flap is folded back and it adheres tightly to the stromal bed without the need for sutures. During the first few hours after surgery, a foreign body sensation and increased production of tears may occur. The vision will be blurry. One day after surgery, vision will be nearly normal. Slight changes in vision may occur within the first few weeks, with vision stability usually reached after 4 to 6 weeks. 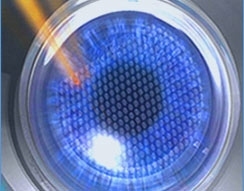 The computer-controlled femtosecond laser provides a more precise, predictable method for creating the corneal flap than the conventional mechanical microkeratome. With the femtosecond laser the LASIK surgeon can customize the flap by defining flap diameter, flap thickness and hinge position and achieve the highest degree of corneal flap precision. Level, parallel cornea segments are cut with uniform thickness at the center as at the periphery. 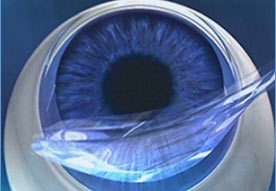 This gives the entire corneal flap more stability, it can be folded back and forth easily, and it attaches smoothly. Flap-related complications such as folds (Microstriae), "button-holes", incomplete or severed flaps are a thing of the past.